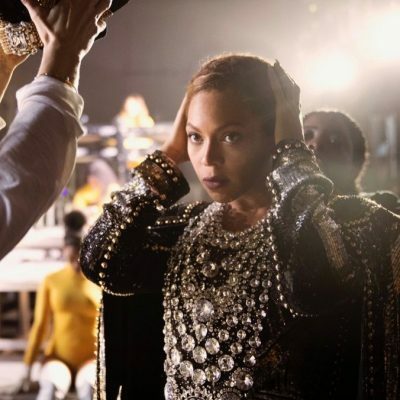 “I am my own muse. I am the subject I know best. 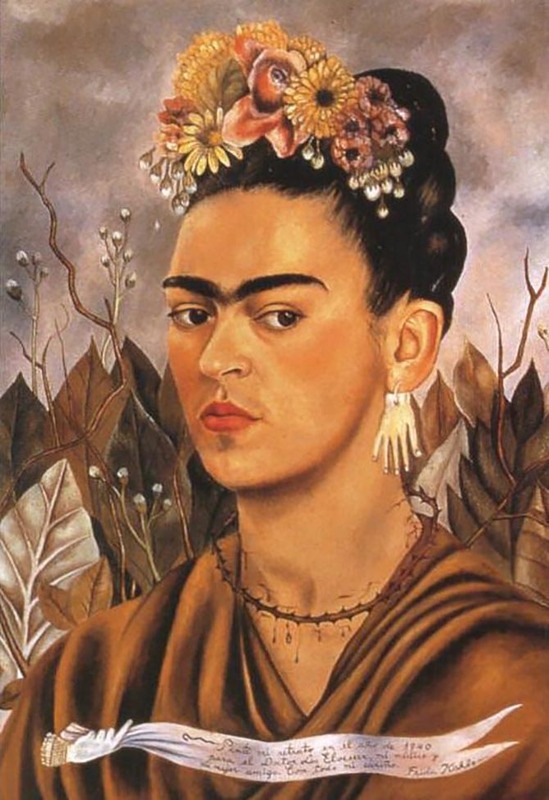 The subject I want to know better.” Frida Kahlo made variations on these statements her entire life. Undoubtedly, she was responding to the question of why she painted so many self-portraits. All the art as well as the innumerable photographs that were taken of Frida, left a powerful visual record of her extraordinary style. 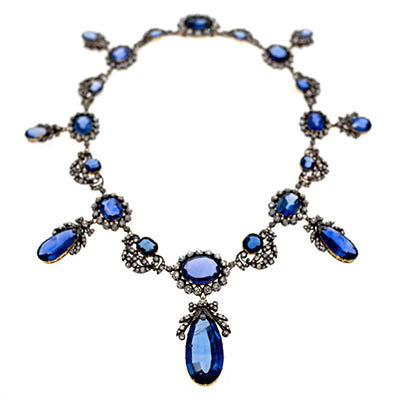 It’s a unique blend of traditional dress and jewels that have been a perpetual source of inspiration to designers over the years. 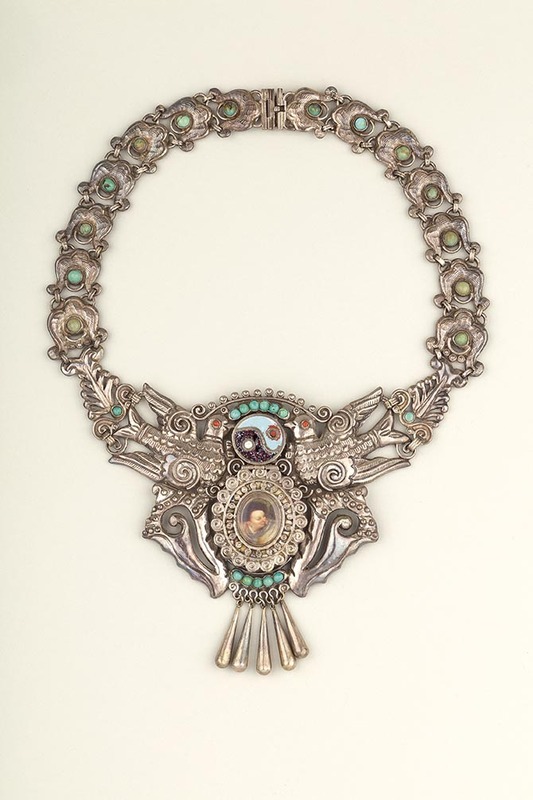 Necklace made by Matilde Poulat, Mexico City, c.1950. Museo Frida Kahlo. Photo Javier Hinojosa. © Diego Riviera and Frida Kahlo Archives, Banco de México, Fiduciary of the Trust of the Diego Riviera and Frida Kahlo Museums. 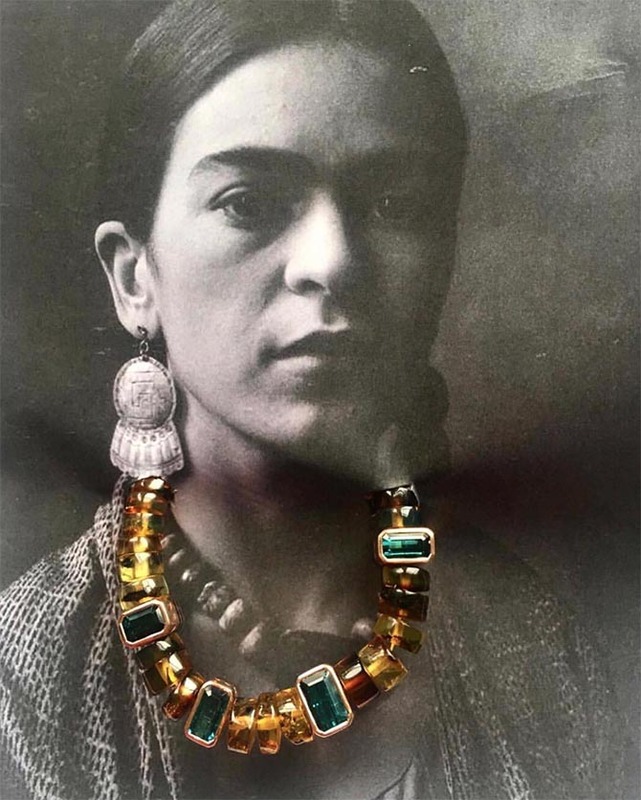 With the V&A exhibition in mind, I have indeed begun to see Frida Kahlo-inspired jewelry, as well as designs that have a strong Mexican vibe, everywhere. Following are a few of my favorites. Reveling in artistic freedom, organic silhouettes and vibrant pops of colors, Carole Le Bris Perez’s new pieces comprise enamel skull earrings, rings and pendants hand-painted in New York, and encrusted with stones such as tourmalines, sapphires, opals and diamonds. 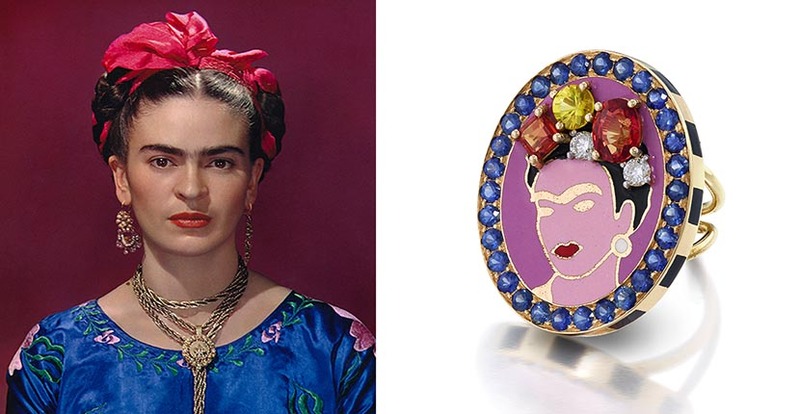 As with each of her collections, the jewelry is inspired by one of her favorite artists – and this time it is Kahlo. “I designed these skulls after Frida, who struggled with her health all her life,” said Carole. 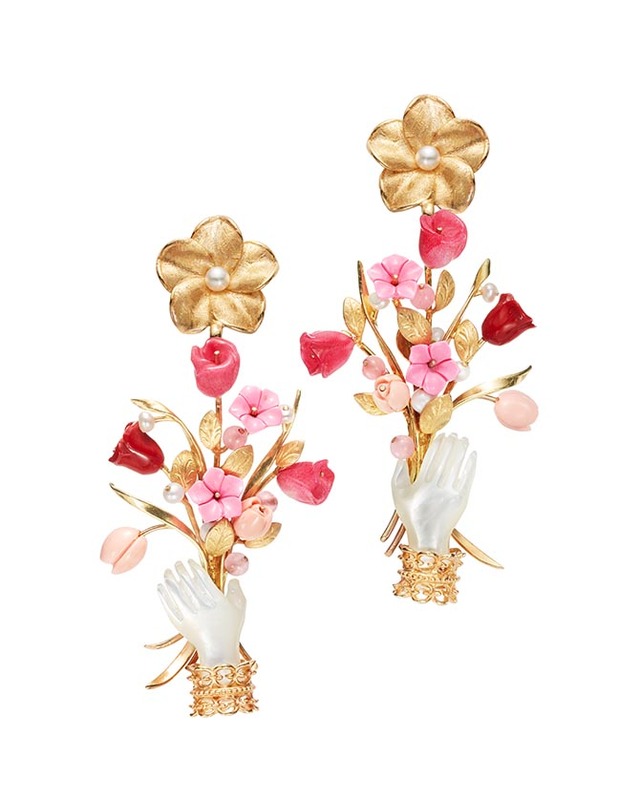 The new jewels from Of Rare Origin’s Blossom collection echo the hand earrings Frida wore in the 1940 self-portrait Dedicated to Dr Eloesser. Hands were a popular motif during the era. According to Frida experts, the hand earrings were given to Frida by Pablo Picasso. 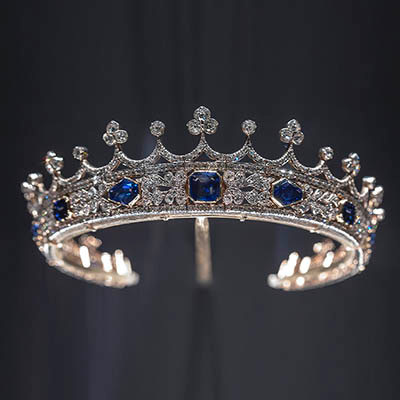 The motif is making a big comeback in jewelry today. 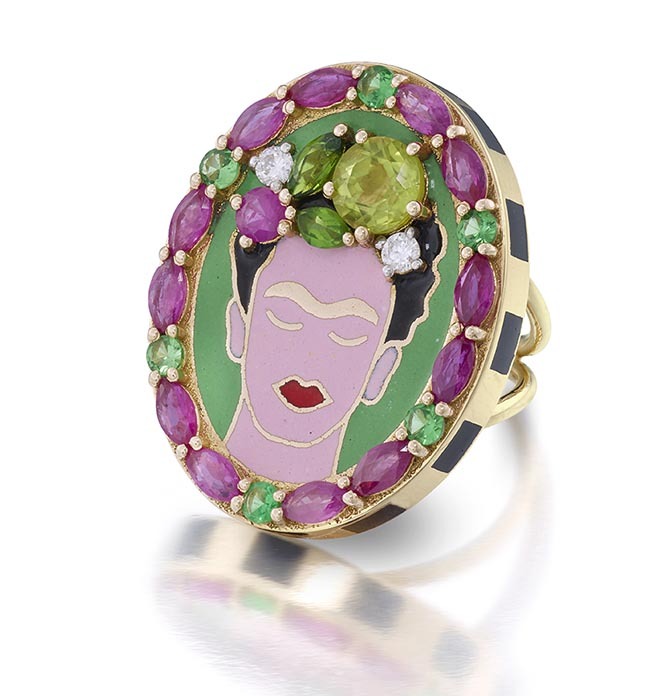 Another element that Frida would surely appreciate about the Of Rare Origin jewels is the vibrant color scheme. Irene Neuwirth spends a lot of time in San Miguel de Allende, Mexico. The vast majority of her work is composed of brightly colored gems set in painterly patterns that share a spirit with the colors of the city. 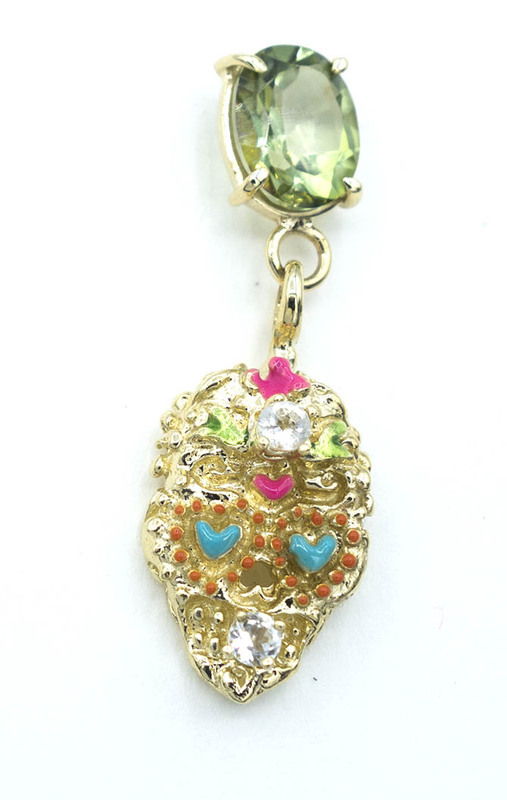 One of her new collections is reminiscent of the cutout jewels of Mexico Frida wore so often. 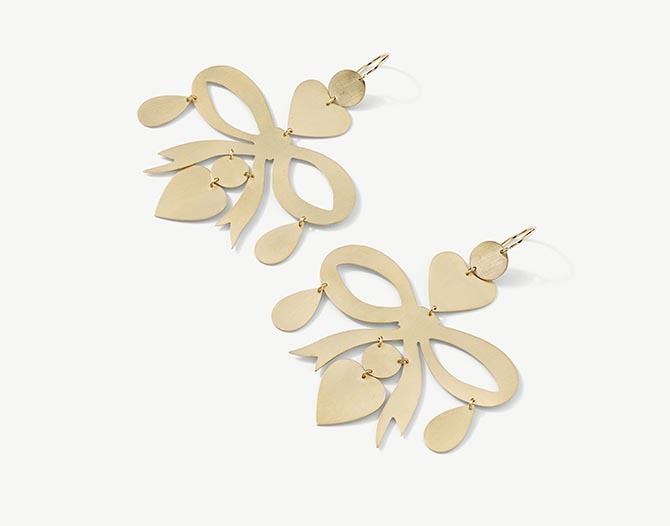 Irene’s cutouts are simplified silhouettes in gold. 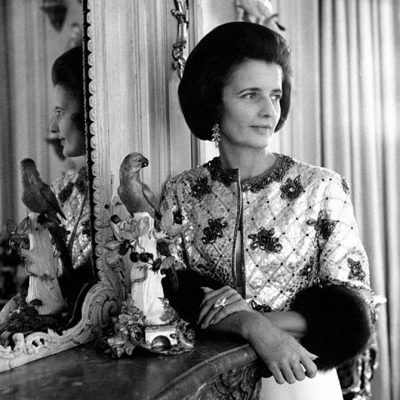 Frida is a constant source of inspiration for Mexican designer Sara Beltrán. 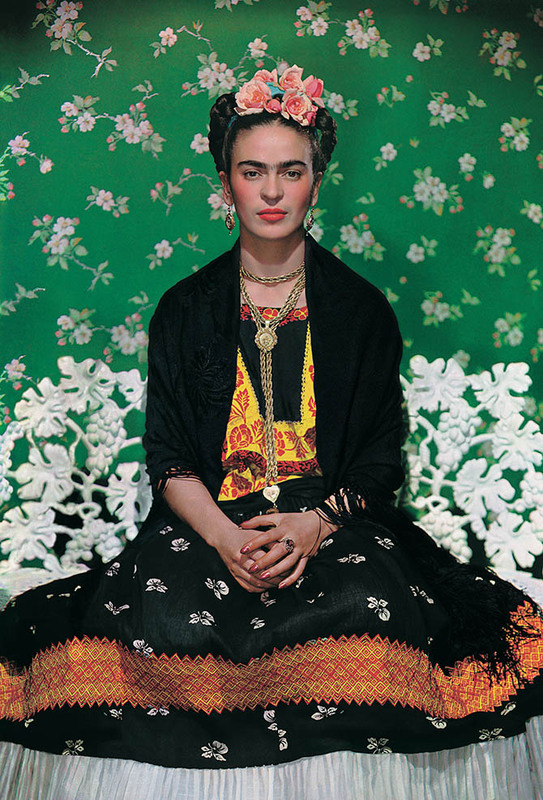 The bead necklaces in her collection are a modern update on the styles Frida wore. Sara shows just how they would look on the artist by attaching them to her photo.